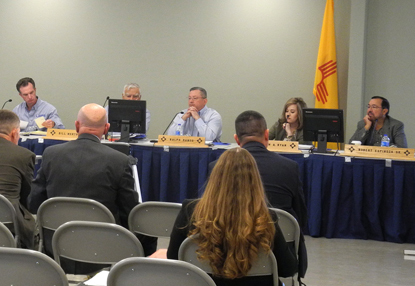 The New Mexico State Game Commission met Wednesday in a regularly-scheduled board meeting, holding the meeting for the first time ever in Artesia. Items on the agenda at Central Valley Electric Cooperative included a request for an extension of a lease by the New Mexico Forestry Division on Richards Property in Santa Fe, which was approved. Col. Robert Griego with the New Mexico Department of Game and Fish (NMDGF) presented the commission with a list of individuals who met the established criteria for the revocation or suspension of their hunting, fishing and/or trapping license privileges, which included 15 individuals for reciprocal revocation under the Interstate Wildlife Violator Compact. These individuals were revoked by compact member states for committing wildlife violations. Forty individuals who have accumulated 20 or more Violation Points in a three-year period were included in the list. Two individuals had accumulated 20 or more Violation Points in a three-year period. These individuals elected to enter into Stipulated Agreements with the department. A total of 245 violators who have failed to pay a penalty assessment within 30 days of the violation and 369 individuals certified by the Human Services Department as being out of compliance with the Parental Responsibility Act were also listed. The commission approved the revocations and suspensions. Stewart Liley, chief of NMDGF’s Wildlife Management Division, presented to the commission final recovery plans for Gould’s Wild Turkey and the Gila Monster, pursuant to the Wildlife Conservation Act 17-2-40.1. Liley then presented the commission with proposed changes to the Migratory Game Bird Rule based on information from the U.S. Fish and Wildlife Services (USFWS), recent survey information, public comment, harvest data, and management goals. The proposed amendments focus on increasing the Canada Goose daily bag limit in the Pacific Flyway to four, increasing the Sandhill Crane quota, and potentially creating a new hunt amidst the Middle Rio Grande Valley duck season in the north zone of the Central Flyway, to run from Oct. 4 – Jan. 18, 2018. Duck season in the south zone of the Central Flyway would run from Oct. 24 – Jan. 28, 2018, and duck season in the Pacific Flyway zone would run from Oct. 14 – Jan. 28, 2018. The department has posted proposed changes to the Migratory Game Bird Rule on its website. Input is being gathered from emails and public meetings with interested members of the public. A final proposal to this rule will be developed and presented at the May 2017 commission meeting. Chief of Education and Information for the NMDGF Lance Cherry updated the commission on progress in developing unmanned, primitive shooting ranges on department-owned and potential partnership properties, and presented an update on the Governor’s Special Hunt Auction and Award Banquet, as well as the New Mexico Outdoor Adventures Hunting and Fishing Show. The commission also received an update on the Albuquerque office complex and the Santa Fe warehouse by Russell Benjamin. Chief Mike Sloane reported to the commission on proposed changes to the Aquatic Invasive Species Rule 19.30.14 NMAC. The State Game Commission adopted changes to the rule last year for the first time since 2009. After a year of on-the-ground experience with the rule, the department is proposing to clarify the language of the rule to make clearer the actions that violate it. The commission says language clarifications will also improve enforcement both by the officer and the courts. The department will post the amendments to 9.30.14 NMAC on its website, and an email notice will be sent to partners requesting comments. A draft of the changes will be presented to the commission at its May meeting, with adoption to be considered at the June meeting. The commission then received a legislative update from Deputy Director Donald Jaramillo, and the meeting was adjourned.